The Block Party guest of honor. Last Sunday, Comme Ça hosted a special “Block” Party to celebrate the start of its Bastille Week festivities. For this occasion, the restaurant featured a special menu with $5 cocktails and $7 appetizers. 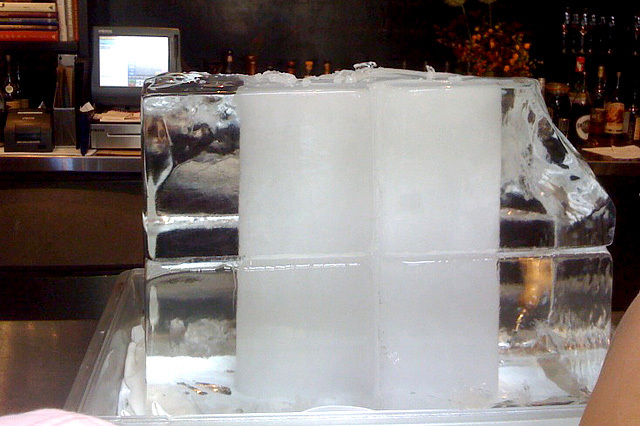 To chill their drinks, bartenders chipped ice from a huge 200 lb. block strategically placed on the bar. By the time my fellow imbibers Scot and Ku arrived, a lively Sunday afternoon crowd had filled the bar area, while the bartenders quickly chiseled away to keep pace with drink orders. First up for me was the AF 69, made with Martin Miller’s gin, Cointreau, honey and lemon verbena. According to the L.A. Times, the AF 69 was named after the daily Air France flight from L.A. to Paris. It’s a cocktail worthy of its transatlantic name: the Martin Miller’s floral notes were very prominent, balanced nicely by the bitter orange of the Cointreau and the sharp fragrance of the lemon verbena. Scot chose the Mr. Rogers, made with Matusalem Platino rum, thyme, apricots, Angostura bitters, and grapefruit peel. We all thought it was a solid cocktail, but of the three Block Party drinks it was probably our least favorite. It was certainly an enjoyable drink, it just wasn’t one that was at the level of the other two. 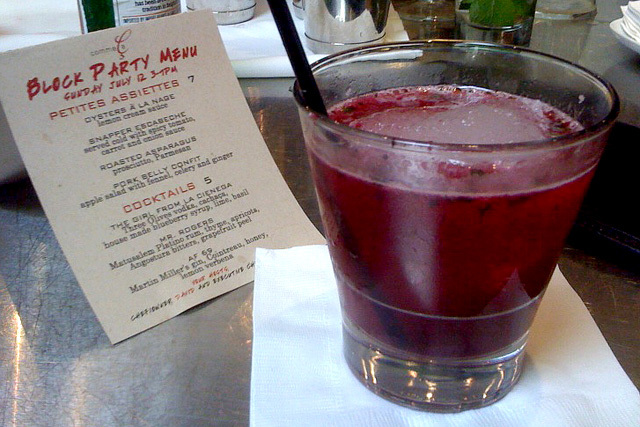 Ku opted for The Girl From La Cienega, made with Three Olives vodka, cachaca, house made blueberry syrup, lime and basil. Colorful, refreshing and delicious, the Girl was hands down our favorite of the three Block Party drinks. The Girl’s refreshing flavors worked marvelously together and she’ll no doubt be very popular this summer. The bar area was too congested for us to stand around and enjoy our cocktails, so we were seated in one of the dining rooms, all the better to refresh our drinks. We didn’t try any of the Block Party apps, but instead ordered up a large steak tartare (Coleman Ranch beef, capers, and cornichons), delicious as always. A chip off the old 200 lb. ice block. We closed out with another round over at the bar, which by this time had cleared up a bit. 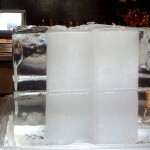 The ice block was now a mere shadow of its former self, but the chips continued to fly as drink orders rolled in. The Block Party was a fun way to spend a warm Sunday afternoon, and a great kick off for Comme Ça’s Bastille Week. Don’t worry if you missed the Block Party; Comme Ça continues the festivities with a $40 prix fixe “Quatorze Juillet” dinner. Available through July 18, this special Bastille Day menu features three courses, the Block Party cocktails, and special wines for New Wine Bastille Day. Vive la France!